It's a brutal old place the countryside. Some passing bird left me this present on my gate this morning. 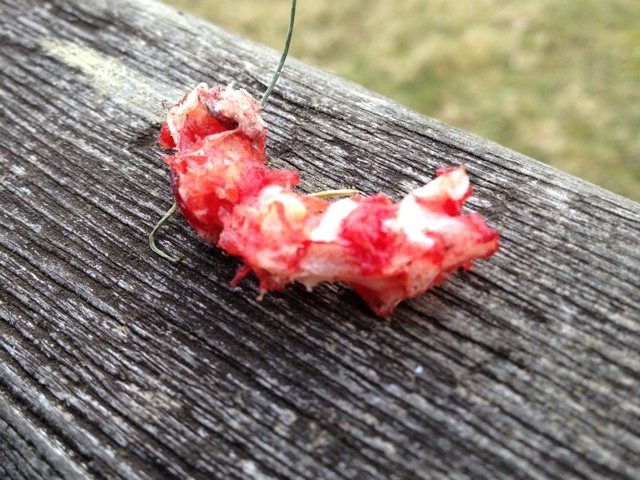 It's a small piece of a rabbits backbone I think. Probably from young Easter bunny despatched by a passing weasel. Then picked over by any passing predator. The whole world is busy eating each other if you look closely. At least my alpacas only eat grass. Well there you go another day another dollar. Harriet and I spent all day yesterday in a cold shed sorting through alpaca fleece for the Toft Alpaca Shop. We buy in tons of fleece a year from alpaca breeders all over the UK which we sort and spin into yarns to supply the shop. We sell many different grades of yarn in a multitude of colours and it's all made in the UK. The beginning of this process begins on days like yesterday when the fleeces have to be sorted and graded into the batches for the mill. 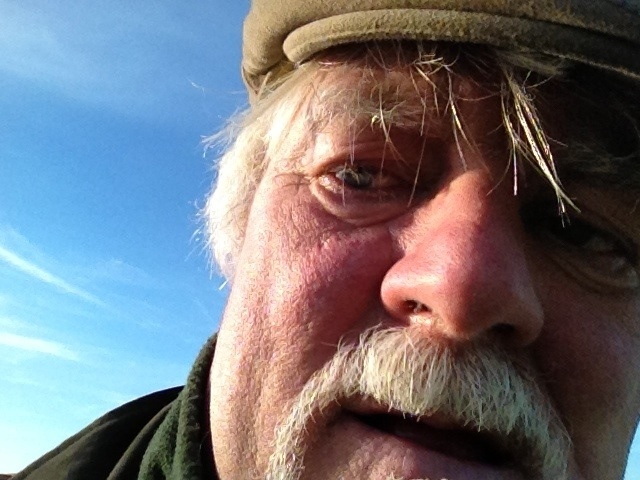 It's a mucky old job and you certainly feel as if you've done a days work at the end of it. Huge gratitude to the man/woman who invented the power shower! 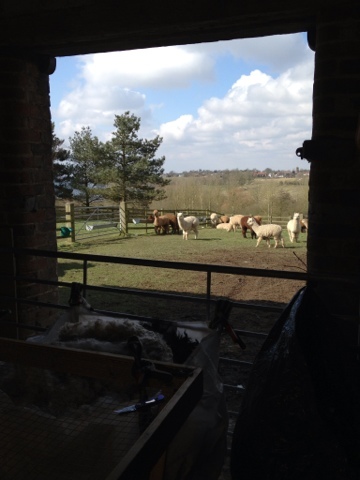 This is the view from the shed and as you can see the alpacas are outside enjoying the sun. Somedays it can feel like they have the best deal... but there again the sleeping outside bit with only a woolly jumper to keep off the frost would definitely not suit. I think I'll stick with the shed! Thirty Toft Alpaca cria now have electronic ID's since Shirley Linda and Linda's daughter Gemma spent this afternoon popping microchips into the juniors. We pop the microchip in behind their left ears with a sizeable applicator. Then the chip sits in a wee pocket below the skin. If we were to put it in anywhere else they have a tendency to migrate and become a devil to find. 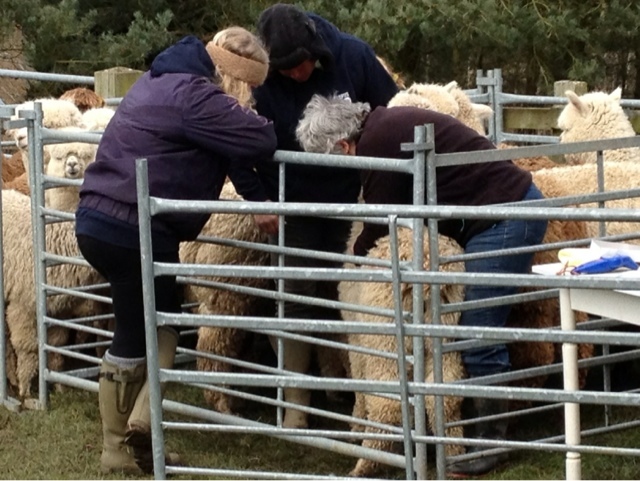 At least now the show team will have the necessary to get into the ring at the Heart of England Alpaca Fiesta on April 27th & 28th. Glad you've arrived with me at this new location. I shall use my best endeavours to amuse with my distinctive alpaca lifestyle .